TLC Graduate Spotlight - Yudy C.
Graduation from TLC in September of 2016 marked the beginning of a whirlwind of productive endeavors for our friend Yudy. Upon her return to her home community of Francia, Yudy began an ongoing volunteer relationship with Carolina Honduras Health Foundation (CHHF). Initially Yudy served as a medical interpreter for two days in November of 2016, and later as a dental assistant for a week in both 2017 and 2018. 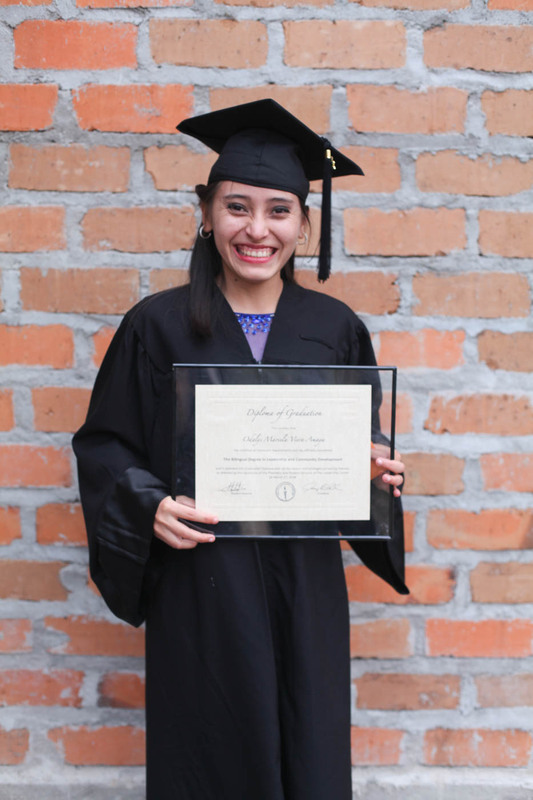 Yudy’s anticipated graduation from CEUTEC is early in 2021 and one of the requirements for her diploma is completing a Project or an Internship in social community service. Naturally, Yudy intends to do both. Some of the community service projects Yudy has already participated in for her degree include Mother’s Day Events, Clothing Drives, distributing food to the needy and planting trees and collecting trash near the ocean. In the Fall of 2018, Yudy also submitted a proposal to the TLC Community Engagement Initiative for Alumni. Yudy received funding and established a jewelry making co-op in La Mayo. The co-op is thriving and continues to recruit members and provide additional training sessions for its members. In addition to financial benefits, this co-op has provided its members with a renewed sense of purpose and self-worth. It has also strengthened the bonds between the women in the community. Yudy continues to provide support to the co-op in the form of motivational talks, marketing advice and jewelry packaging consultations. Yudy’s newest project is assisting the farmers in her community with their tax preparation. This endeavor will provide Yudy with practical experience beneficial to her future career as an accountant. In Yudy, we feel the next generation of Hondurans is in very good hands. Congratulations, Yudy. We applaud your success as a business owner, student and community volunteer. We are very proud of you. I chose to serve as a volunteer with a medical team for a whole week in Limon Colon, during my quarterly vacation. I am thankful to God for this opportunity that I had. I went around my community with two members of the medical team, Dr. Joe and Christy and gave medical assistance to elderly people who couldn’t go the clinic due to their physical disabilities. We also helped prepare the medicine for the staff to use. Through this service I was able to meet more people in my community and build new relationships. I also enjoyed learning more about the community. I felt joy seeing smiles and hope on their face. I felt useful in my community and I realized that I don’t need to be powerful or have an “important” place in my community to start doing something that matters. As I served around my community I learned about the needs of the people but I also sensed a spirit of change; they encouraged me to keep working hard so that someday I can help my community with what I am learning here at TLC. I would like to help the people of my community discover their skills, their abilities and to know that they are valuable and powerful and that they can make changes in the community, because they are a pattern of change. I would like my community to have good opportunities for women, men, youth, children, and elderly people, so that they can have a better lifestyle. I know that I am helping reach that goal by working hard with them. Finally, I just want to say that I really enjoyed serving in my community and having a nice time with many people. I submitted a proposal to TLC requesting a small investment toward a jewelry-making community project and was approved to receive the funding. The original idea of the project was at a local community at the church five minutes away from o La Ceiba´s dump where people go there to look for plastic bottles, useful stuffs from the garbage for recycling so that they can make their daily living, however the pastor from the church stated that recently there were some safety issues and that he was concerned about it for the tutors, besides that someone was living in the place where the lessons were going to be taught. I looked for another church of a pastor who works for Carolinas’ healthcare foundation. He liked the project and his wife, Leslie helped me to communicate to the people around the community. It took place in a really rural community called La Mayo, it is about 40 minutes away from La Ceiba. The project started on Sunday 26th at 9:00 am and it finished at 2:00 pm. There were two tutors giving the classes and I was making sure that everything was well organized, and I also was supporting the ten ladies. Anahi, one of the tutors that I hired told her mother Mirian about this project and she volunteered for it. She gave a small speech about entrepreneurship and she gave a testimony about her little jewelry business. She also belongs to a small psychological motivation group. By lunchtime we served some chicken sandwiches and the ladies brought their children to the church. We did like Jesus with the bread and fish because there were many people. The ladies learned how to make a purse and two earrings’ style. You may be wondering about the follow up for this project, that is totally understandable. We will go back to do another session in September. We left some products so that they would be able to practice and there are two goals, one personal goal and a team goal. The personal goal is if someone makes about 5 different products by the time we go back, we will give Lps 200 bonus. The team goal is to get all of them organized as a cooperative and make products and resell them and save the money, so that they can support themselves obtaining the profits. One of the learners stated, “People lack of many opportunities and now we can focus in something else, rather than just seeing people passed by and wait until our husbands and children come back home”. I really want to thank you under the name of these ladies who took benefited of this project, personally I'm truly grateful from the bottom of my heart for the special opportunity that you gave me. I just wanted to let you know how generous and supportive I think you are. TLC Launches 17 New Graduates! The Leadership Center hosted its graduation for two cohorts - Cohort 6 and Cohort 7 - on Saturday, March 17th. Between the two groups, we graduated 17 students, who are preparing to launch into the next chapter of their lives. Some have already launched small businesses; some are seeking employment opportunities with bilingual schools, NGOs, or other businesses; and some plan to continue their studies. Leadership Mission International is extremely proud of their accomplishments, and we look forward to following them on their professional and academic journeys in the coming years. I like nature because I love its Creator. I enjoy working in the gardens because of what happens in them. It is amazing because it’s God’s hand that makes life possible. My experience of working as a gardening has been great, especially when I am watering the plants. When I am watering the plants, I have a lot of time to think; I think of many things that have happened in my life and I also think about the future. The truth is that I enjoy every work that a gardener has. I enjoy the entire process. Starting with the preparation of the land and soil to the harvest. I enjoy the whole process because it reminds me of the spiritual life. I think in how God prepares me and how he is always taking care of me as I have to do with the garden plants. During my time of working in the gardens I have learned many things. I have learned how to be patient for the harvest. I have learned that I need to take care of the deeds if I want them to grow, because if I don’t take care of them they won’t’ grow and I won’t’ get anything out of it! The most important thing I have learned is that if I want to harvest something [in life], I must plant first. In Christmas, we remember the birth of the World’s Savior. The most powerful king who was born with humility and who has brought peace to our hearts, giving us the best example of love. Every Christmas in Honduras we remember the birth of Jesus through the traditional advent celebrations. We start a few days before Christmas, visiting homes in the community to think about the moments when Mary and Joseph were looking for a place where Mary could give birth to their first-born son, Jesus. We sing Christmas carols at the front door of every house. Then we share food with the people who participate in this celebration. On Christmas day, we start very early in the morning to prepare all different kinds of good. We make Tamales, Torrejas, sweet breads, Empanadas, rice with chicken, squash with honey, baked chicken, salads, fruit cocktail, baked pork and cakes. In many family, we had a bonfire in our yard and put tables and chairs around it. Our neighbors, friends relatives and church members come to our house and we share the delicious dinner together. We talk about our experience during the year and everyone shares their hopes for the new year. Christmas brings us together and it reminds us that we should live with humility, peace and love. I want to share with you a little bit about my last weekend. One classmate of mine and some of the first-year students went to a village nearby TLC to sell bread. The reason of why we went is because a student’s mom is sick and needs money for a surgery, so we made bread on Saturday and went selling on Sunday. We all were so happy to help. It was fun because we met new people and we spent great time together. We went to two soccer fields and we finished selling in the houses around the community. It was nice because we got to share information about our University. People asked what TLC is, how the students get here and what we are studying here, so we took advantage of the opportunity to share about this organization. It was a really nice experience, I enjoyed it! My name is Mairyn Hernandez. I am the leader of the Book Club at The Leadership Center. I have been doing it for 5 months now. A woman named Mrs. Chris started this club last year when she was teaching. When she left, she asked me to lead it. I learned from her how to lead a book club. She is very good at doing it and I really enjoy leading it now. The Book Club is attended by some first-year students and second year students. We all meet together every Monday evening to discuss short stories. The stories are fiction stories but at the end of our discussion everyone is able to find something interesting in the story that we can apply in our lives. Every story has a moral that we can learn from. While discussing the story, everyone is able to learn new English words that they don’t know which is good. I think having a book club is a really good way to help first year students learn more English and for second year students to improve their English pronunciation. I really enjoy this group because it is a good opportunity to build community and have fun together. I love reading the stories and having good discussions with my classmates!